^ “10 things you never knew about AK47 Kalashnikov rifle that has killed more people than any other gun”. デイリー・ミラー. 2016年9月29日閲覧。 。"7. 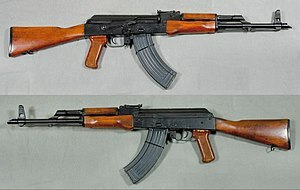 The Kalashnikov rifle is in the “Guinness Book of Records” as the most common weapon in the world. Currently, there are about 100 million AK. This means that 60 adult inhabitants of our planet have on one machine." ^ ホビージャパン 2014, p. 63-65. ^ ホビージャパン 2014, p. 66. ^ ホビージャパン 2014, p. 10-12. ^ ホビージャパン 2014, p. 12. ^ ホビージャパン 2014, p. 12-13. ^ ホビージャパン 2014, p. 14-16. ^ ホビージャパン 2014, p. 28.